The prints my boots left when I was on the deck feeding birds on the first day of March look like I was crashing around but I didn't have any falls or difficulty. I bet it looks exactly like that out, without any processing. That snow looks (too) deep! So cold! I love the way snow looks, but I'm glad we don't get much here. 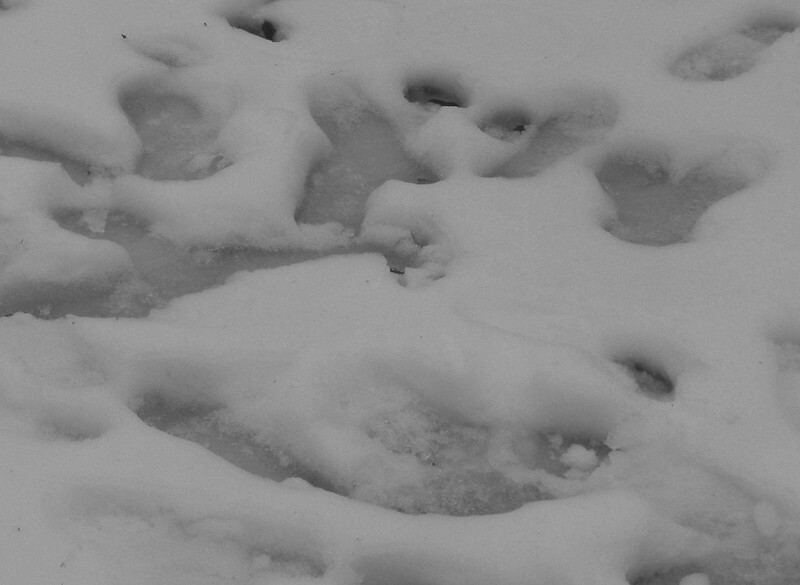 The imprints in the snow emphasise just how icy is this world. Lovely tones. Lovely serie, and it is perfect in b&w! Brrr! That's how our deck looks. Brrr -looks too cold for me. Fantastic picture. Hopefully spring will be here soon. Lovely photo in B&W! Fine idea! I have enough of snow for this winter! Hope that the sun is shining wherever yiu are. Fun idea to thake a picture of the footprints.